Asked how they feel about their monetary union, people in the eurozone separate economics and politics. Where are we going? 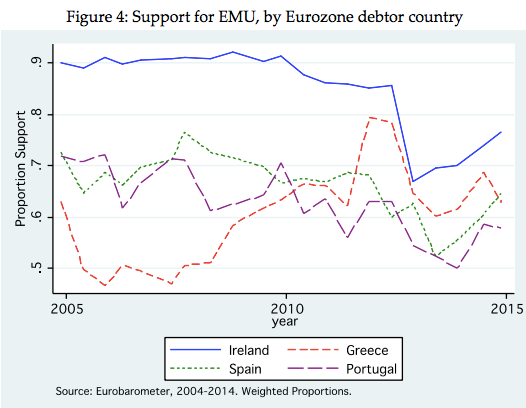 To what might be the biggest eurozone challenge. 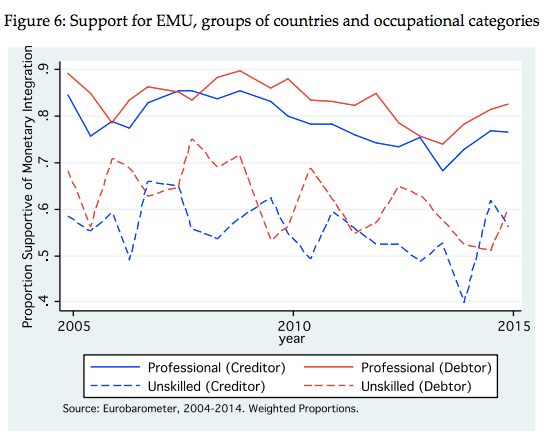 This graph and all that follow are from “The crisis, the public, and the future of European integration” by Jeffrey Frieden (June 2015). Transition refers to economies that have recently evolved to a market. 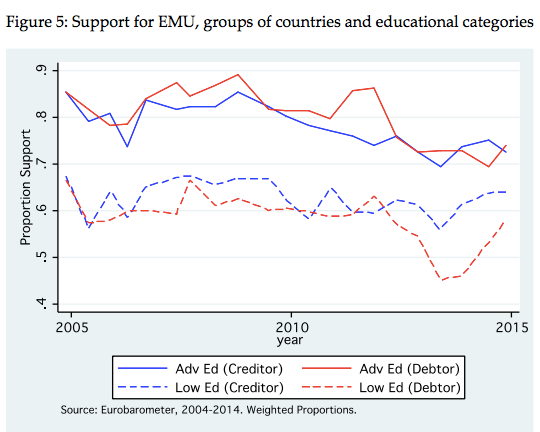 But still, support for EMU is relatively solid. By contrast, when we look at politics from a trust perspective, we see dips that go below 20 percent. 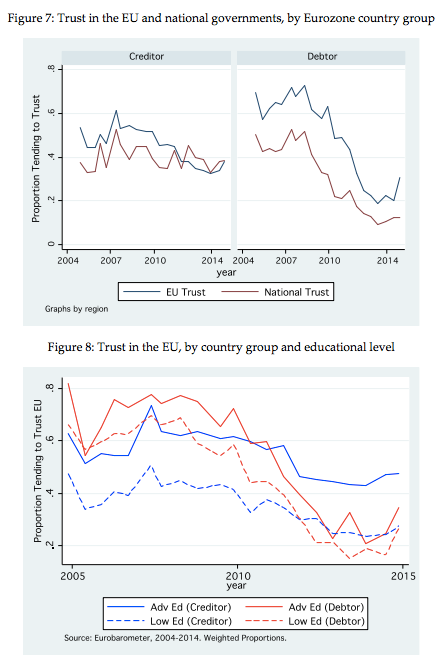 During the past decade, trust in EU leadership (the surveys did not cover the eurozone specifically) has plummeted. Explaining in his paper on EU and eurozone sentiment, Harvard scholar Jeffrey Frieden says people do not trust the EU leadership or its institutions. We could say that people in the eurozone like the economic idea of one currency but feel negatively about their politicians. In a 1997 column, Nobel laureate in economics Milton Friedman (1912-2006) explained the basic contradiction in European monetary union. The union he said was stimulated by the quest for political unity. However, the flaws in their monetary union will increase political tension. You can see above through Dr. Frieden’s graphs that indeed political distrust has grown. 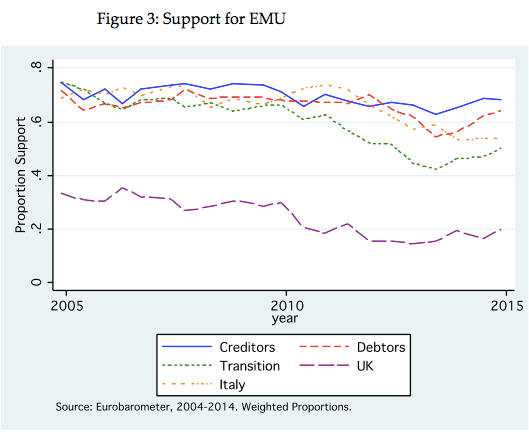 So what might be the real eurozone problem? While millions of people want the euro, their political leaders will experience increasing distrust and disunity because their approach is flawed.